Slot game is based totally on a Random Number Generator, therefore there can be no powerful strategy in beating slot machines. There are still some things you can do to increase your possible odds of winning and to reduce losses. There are lots of various strategies that can be applied in online and land casinos. The main idea is that you can influence only one thing in slots - the amount of money you bet. So, all these strategies are in fact betting ones. All the rest of the silly recommendations are just slots myths. Do not play slots with money you cannot afford to lose and always remember that the casino has a slight mathematical edge over you. This is probably the most important strategy for any gambling game. 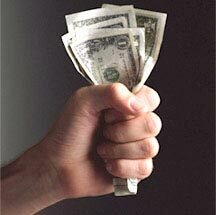 Decide on your bankroll for the game and never cross the limit no matter how much you want to win back all you've lost. The Bankroll is the amount of gambling dollars you are ready and can afford to wager or lose when playing casino games online or offline. Also, it is very important to learn "stretching" your money over time. This means that you must set up stakes for each game you are going to play out of your overall bankroll and stick to these limits. If you visit a casino several times a week you must at least decide what sum you can afford for each day and not put in more money from other sources when you are out of the limited stake. To help you figure out the bankroll for this or that slot game we have created a special bankroll calculator. You just input the data which includes the period of time you are going to play (Time of play), the maximum coin-denomination used in the game per line (Bet), and how many paylines you bet on (Paylines). The calculator will generate the minimum bankroll you need for the game. Probably, one of the best ways to stretch your gambling money, stay in the game longer and win more often is always to look for slot machines with the highest paybacks. Slots payback or the return is the amount of money the slot machine pays out as wins from the total number of credits wagered by the players. The payback is always shown as a percentage. Most slot machines are programmed to return 82-98% of the wagered money, however if you play slots online you can expect better paybacks than in land casinos. Most casinos reveal their slots payback percentages and if you can get this information choose only those slot machines that pay out the best and are known as "loose" slots. As a rule, the higher the coin-denomination of the slot machine the higher the payback. Thus, high-roller slots pay out more than nickel machines. Of course, this is not always true for all types of slot games, especially online slots. Here are examples of the most widespread slots and their average paybacks. The payback percentages vary from casino to casino and that is why it may be difficult to find the best machine on the gambling hall. One of the wisest tips here is to avoid playing slots in airports, bars, gas stations, motels as they usually pay out not more than 80% and even down to 50%! 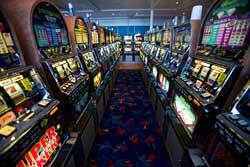 Such slots are also called "tight" machines and they are the main source of profit for most establishments. It is believed that casino managers develop a strategy on how to locate slot machines in the gambling hall in order to attract players and still get good profit. Really, if you play the slots several times at the same casino and can't win or don't even notice lucky people winning jackpots, you will decide to change casino. That is why the casino owners try to balance the number of high-paying and low-paying slots. So, slot machines with the highest payback of about 99% are located deep in the slots rows, however in such positions so that they are visible for most players from different angles. This rule works for the progressive slot machines as well. Meanwhile high-paying slots alternate with those that provide low payback percentage. If you don't want to lose all the time, don't play at slot machines close to the doorways, elevators and areas with the table games. Rather go to play slots close to the coffee shops and places where there are already many people. You can read about different strategies on how slot machines are located in casinos in slots books published by experienced players and slots experts. NB! Don't trust most ads that advertise you to try the best-paying slot machines with amazing paybacks over 100%! In most cases this is just trick aimed to draw the players' attention to new slots or those machines that in fact are very "tight". Most experienced players develop their own strategies that mostly deal with the betting amounts. All such strategies and techniques state that the players must bet a specific number of coins (determined beforehand) for each spin during the game and thus minimize the loss. As you understand, such recommendations help to structure the game and again manage the bankroll. A good example of alternative slots strategies may be the umbrella strategy, play and run slots strategy or chicken strategy. If you still don't feel confident at slots, remember that there are other ways to save up money for gambling or win large without spending much, such as slots clubswith numerous comps and regular tournaments.